State Sen. Lloyd Smucker (R., Lancaster) has crafted a bill to issue warnings to underperforming schools, and if they still fail to improve, place them in a new state-run district. Pennsylvania's lowest-performing schools could be given an ultimatum - reform quickly, or face relegation to a new, state-run district - under legislation to be introduced soon. The bill, crafted by State Sen. Lloyd Smucker (R., Lancaster), could remake the Philadelphia School District, where most of the struggling schools now reside. Supporters say it has a shot at passage in this legislative session, particularly as a way to partner the increased education funding Gov. Wolf seeks with accountability measures palatable to Republicans. 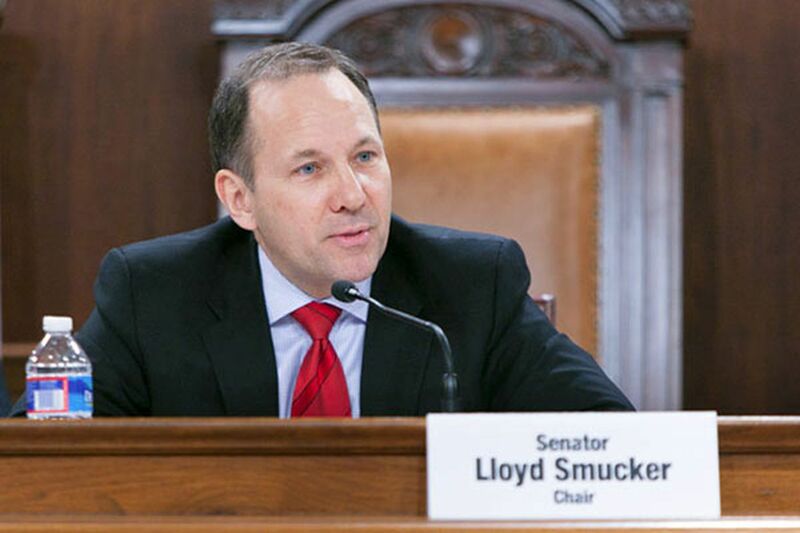 "Our taxpayers want to know that the dollars that the state is spending on education are achieving the results that they should," Smucker, chair of the Senate Education Committee, said in an interview. He said the bill had bipartisan support. It is modeled on a handful of efforts that have been attempted in places like Tennessee and Massachusetts with mixed results. The legislation is bound to reignite heated debate in the Capitol over school accountability - even more so in the next few months, as Gov. Wolf has proposed a substantial boost in funding for public education in his budget and will be negotiating with the GOP-led legislature on the best way to drive dollars to public schools. And the Democratic governor could end up being the bill's biggest foe - he is not a proponent of traditional school choice and just recently questioned the need for more charter schools in Philadelphia. His spokesman, Jeff Sheridan, said Tuesday that the governor would wait to see the bill before taking a position but that Wolf was committed to restoring the financial resources schools need to be successful. "School districts have really suffered because of a disinvestment in public education by the previous administration," Sheridan said. "The governor is committed to public education; he wants to ensure that the money is going to the classrooms." Under the legislation, the lowest-performing 5 percent of schools - both district and charter, as determined by the state-calculated school performance profile score - would be directed to transform themselves through tools such as contracting with outside providers or converting to charters. They would be exempt from union seniority rules, and parents could also force changes with a majority vote. If the schools didn't turn around within three years, they could be placed into a new "Achievement School District" to be run by the state. The lowest 1 percent of schools would have two years to transform, or face placement in the state district. The state-run district would have latitude to close schools and authorize new charters. Schools in the state system would be funded the way charters are now, with a set per-pupil allocation. Nearly 100 Philadelphia schools, most of them within the district, are now in the bottom 5 percent of schools statewide. Nineteen city district and charter schools are in the bottom 1 percent. The legislation is sure to draw intense fire from those who say it handcuffs districts already struggling with a lack of resources, and praise from those who say it forces schools that have underperformed for decades to fix themselves or face real consequences. Pennsylvania must fund its schools more equitably, Smucker said, and while a school-funding formula is in the works, more urgency and oversight are needed to ensure additional resources aren't used for failed policies. "I think our students deserve better, and deserve us doing all we can to provide the tools to our schools to provide that education," he said. Statewide, 90,000 students, mostly poor and minority children, are educated in the lowest-performing schools. Philadelphia Superintendent William R. Hite Jr. said he is interested in additional tools for overhauling schools - a centerpiece of his action plan for the district - but said he needed to know more about the details of the proposal. "It would be of major significance if it provides the ability to focus on turnarounds, but we're very concerned about the mechanism for funding," Hite said. "My concern with this is something that creates an additional unfunded mandate where there are requirements for turnaround without the resources." Even before introduction, the measure is proving controversial. Mike Wang, executive director of the Philadelphia School Advocacy Partners, said his organization was "very supportive" of the coming legislation. "This has worked in other states, both on the left and on the right," Wang said. "It seems to be really grounded in empowering local school districts to address their lowest-performing schools." But Donna Cooper, head of Public Citizens for Children and Youth and a former top official in the Gov. Ed Rendell administration, called it a bad idea, "a diversion and a smoke screen," and said that research has not shown that changing school governance changes student outcomes. "A school without books, with class sizes of 30, that has students starting without full-day kindergarten or prekindergarten, a school without a nurse, is going to fail," Cooper said. "It doesn't matter who runs it." The state has had little success in running schools, she said, pointing to the Scotland School for Veterans' Children, the state-run school that closed, and a state-run school for the deaf, which transferred to private hands. In Harrisburg, the proposal will also be divisive. Sen. Andrew Dinniman, the ranking Democrat on the Education Committee, said that although he had not seen the proposal's details, he believes there cannot be a conversation about how to adequately deal with consistently low-performing schools without a serious discussion about the impact of poverty on education. The Chester County Democrat noted that the majority of the schools that consistently perform in the bottom 5 percent are in poor, often urban areas. "I don't see how we assist those schools without looking at the larger question of poverty and its impact on those schools," Dinniman said. "Many children who live in extreme poverty suffer extreme trauma, and until you deal with that trauma, you can't transform that school." He said Smucker's bill is reminiscent in some aspects of a highly charged voucher measure that was pushed hard by Senate Republicans in 2011, when Gov. Tom Corbett was in office. The bill sought to give taxpayer-funded vouchers to children in the state's lowest-performing schools, allowing them to transfer into private or parochial schools. It was unsuccessful, despite heated negotiations with the Republican administration and a GOP-dominated legislature. Sen. Vincent Hughes (D., Phila.) said Tuesday that while he, too, had not seen Smucker's proposal, "on its face, it sounds like a backdoor move to charterize schools." "If folks want to take the bottom 5 percent of schools that are not performing and say, 'We've got to do something dramatic about this,' then the something dramatic has got to be something that is equitable across the board," Hughes said. "It can't be just a vehicle to drive kids into charter schools . . . which is what it sounds like." Legislation will soon be introduced to transform the state's lowest-performing schools, both charter and traditional. Under the proposal, a state-run school district could take control of some schools. Those in the bottom 1 percent of performance statewide would have two years to improve or face placement in the district; those in the lowest 5 percent would have three years to improve or possibly be given to the state district. The bill includes exceptions to exempt certain schools, including those that serve special populations, those that have recently undergone turnarounds, or those that are outperforming the local school district. The earliest the schools could be affected is 2016-17.